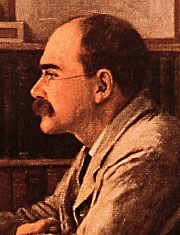 Born in Bombay, India, Rudyard Kipling was educated in England, returning to India in 1882. As a poet, author, and recipient of the Nobel Prize for literature in 1907, he published over 80 stories and ballads. Most of his work celebrated the English Empire and its soldiers in India. Although only active masonically for a few years, Freemasonryâ€™s effect can be noted in many of his works. His autobiography also has a number of references to Freemasonry. Hope and Perseverance Lodge No. 782. E.C. Authorâ€™s Lodge No. 3456, E.C. Motherland Lodge No. 3861, E.C. The Builders of the Silent Cities Lodge No. 12, St. Omer, France, F.R.